This is my very first "gear review", so hopefully it will be complete enough to be helpful. Our All American Sun Oven arrived via UPS yesterday, so we were anxious to test drive it. 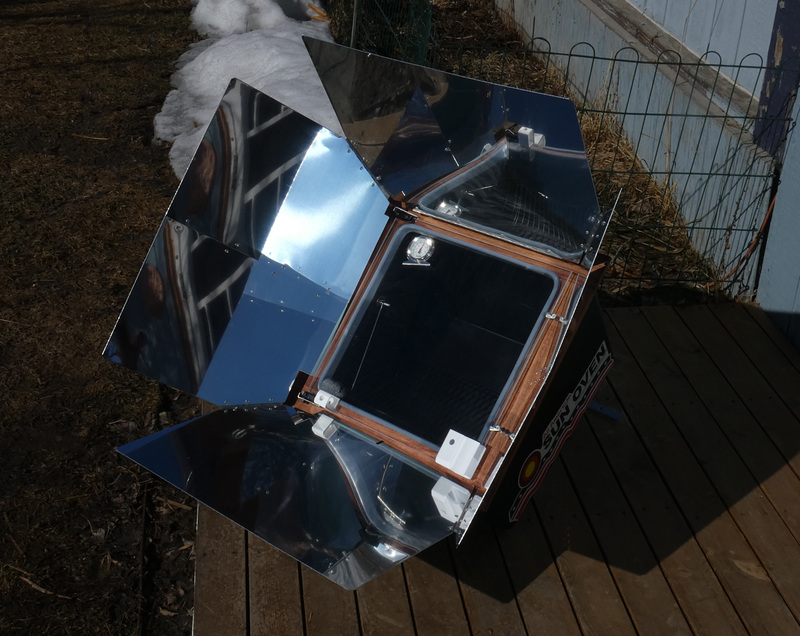 The concept may not be new to most of you, and I have spent a couple years looking at DIY plans using everything from cardboard boxes to plywood "ovens" using aluminum foil reflectors. We finally decided to add one of these to our "Prepper's Tool Box". It turns out it will see much more use than just "emergencies". The box itself is a composite material with a heat-resistant coating on the inside. It is black to absorb as much solar heat as possible. The reflectors are Mylar coated and come with a protective plastic that needs to be removed before the oven is pressed into use. This particular product (there are many configurations available depending upon how much you want to invest, and your intended use) comes with a gamble-style rack, 3 racks for dehydrating, or baking cookies, a 3 qt roasting pan. 2 circular roasting pans, one with an enameled lid, and one with a vented glass lid. The gamble rack is used so that the product being cooked stays level regardless of the tilt of the oven. There is a height adjustment leg in the back so you can tilt the oven to aim directly at the sun. You will see two white devices at the front bottom edge that are ingenious devices to aim the oven using the shadow of the sun so you get the maximum exposure during the cooking process. The reflectors are hinged so they fold up for transport, and there is a carrying handle in the front. Not counting the pots it weighs in at about 23 pounds. This view is with the reflecting fins deployed, and ready to go. The air temperature was a balmy 48F deg and we still have a few snow drifts in the yard. After pre-heating the oven for about 20 minutes, the temperature climbed to around 300F deg. 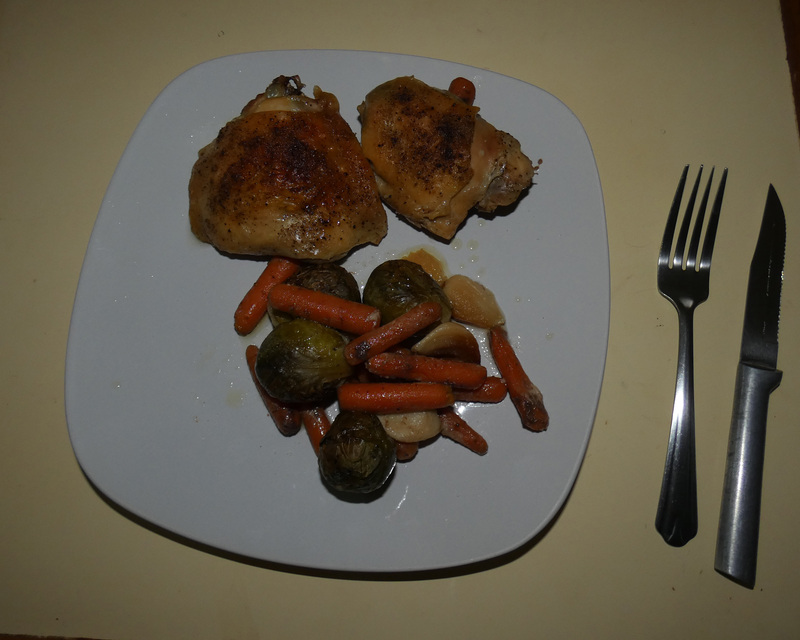 We decided to see how it would handle chicken thighs and veggies, so we layered baby carrots, garlic cloves, 4 chicken thighs, and some Brussels sprouts in the roasting pan. 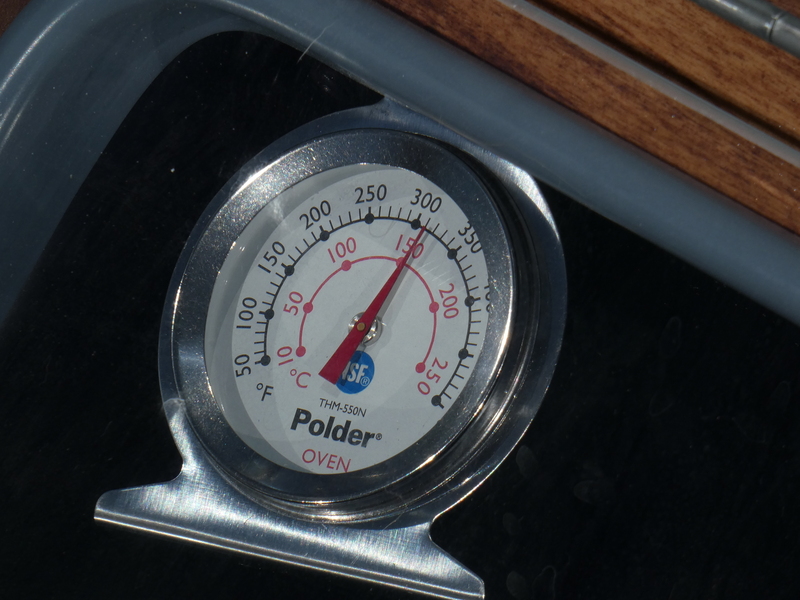 We set the pan on the gamble rack when the oven reached 350F. After about 1 hour, condensation began to form on the glass cover of the box. There is a gasket sealing the glass lid and box with two lugs to keep heat and moisture from escaping. We pulled the pan to check the internal temperature of the chicken and found it to be 205F!!! 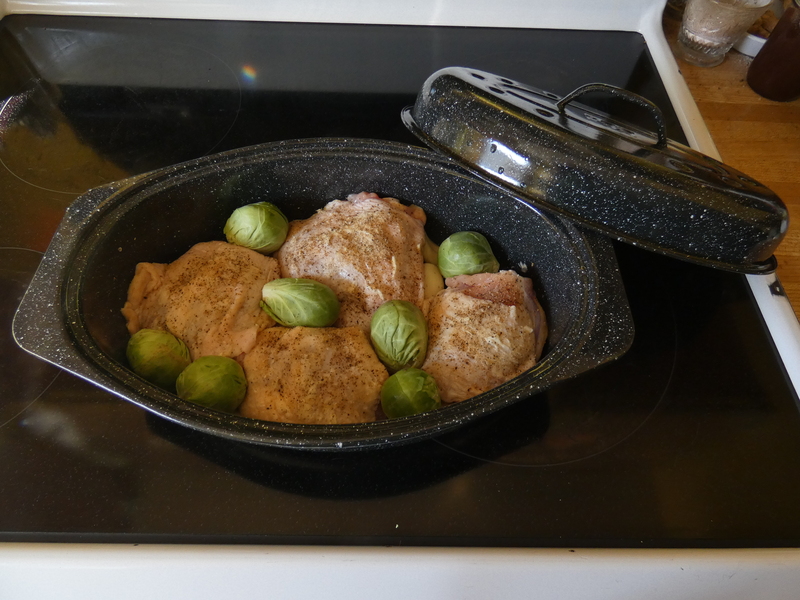 The basting buds on the lid of the roasting pan helped with browning the skin of the thighs, even with the high humidity. Even the sprouts has a nice browning. 1. Cooking time is comparable to a conventional oven at a similar temperature. 2. In the future we will place a silicone baking sheet on the gamble rack to prevent and slipping/sliding of the cook ware on the rack. The enamel surface of the pans and rack are really slick! 3. If you let the food go much beyond the point where the glass lid steams up, you will have to deal with condensation in the oven box. We went a little over the necessary time, and there was about a cup of water in the oven that needed to be mopped up. 4. As the manufacturer states: "Read the instruction -- TWICE -- before using." This little jewel will see a lot of use this summer when it's just too hot to want to use our kitchen oven or stove top for cooking. It is compact enough that it can be carried on car camping or picnic trips (it's just about the size of a 22" Weber kettle grill w/o the legs). During our fire season here this is a perfect alternative to gas stoves when fire restrictions prevent campfires or open-flame cooking. This kit came with a neat gadget called a "Multi-Fuel Water Purification Indicator (WAPI)". It's a vile with a bit of wax inside that snaps onto a flotation device (which doubles as a carrying case for the vile). The Indicator floats in any water filled container. When the water reaches a temperature of 150F for at least 6 minutes, the wax melts and flows to the bottom to the vile, indicating the water has reached "pasteurization temperature" and is safe to drink. There are other styles of WAPI which use a lanyard, but that can be a problem when used with open flames or fires. This floater doesn't have anything to catch fire if it dangles outside the pot. 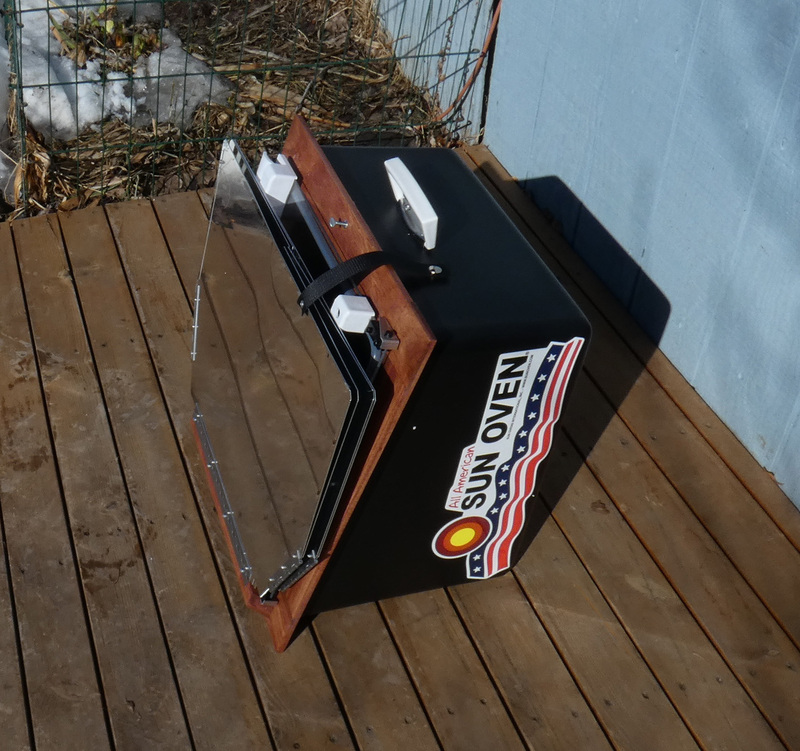 The All American Sun Oven is available on Amazon, and there are several different "kits" depending upon your budget, or needs. 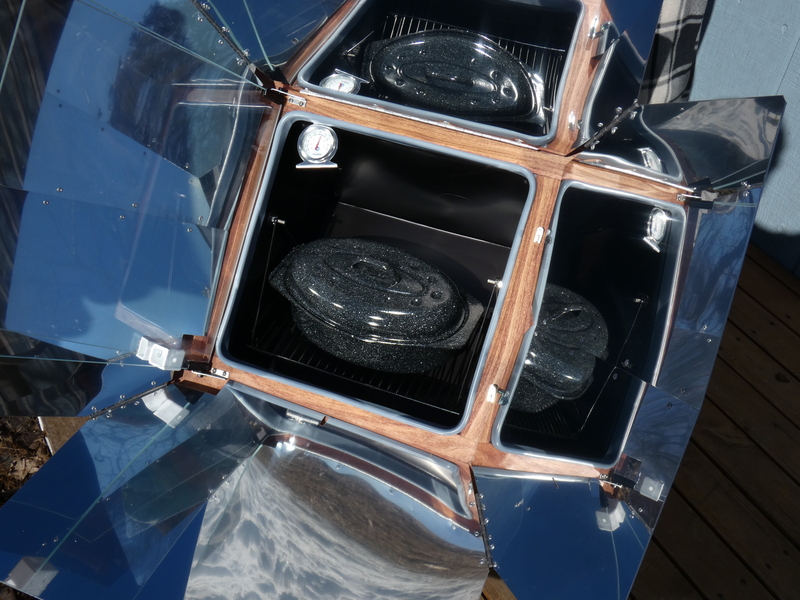 Excellent review OP, looks like a winner that will serve to remedy quite a few cooking and baking needs, especially if one is a prepper, I for one would like to see more of your Sun Oven adventures from time to time. Great review OP. I have two questions. First is pre-heating just a matter of letting it sit with nothing in it until it reaches a certain temperature or.....? Second question is can you broil meat with this set up? The little vial is pretty slick. Might have to get one of those just for fun. Just a quick Google-search reveals a W-I-D-E range of prices for this unit....$99-$369! What's a realistic price look like? I assume you researched prices before ordering & can recommend a source. Preheating is letting it sit empty, just like you would preheat your kitchen oven before baking or roasting. You can't really "broil" meat in it, but you can certainly braze meat in it. Everything other than baked goods must be covered. When you bake in it, the glass lid is propped open about 1/2" to allow moisture to escape. I've never seen it for $99. The bare-bones oven with no racks, pots or accessories is on Amazon for $269. The kit we got runs $339. 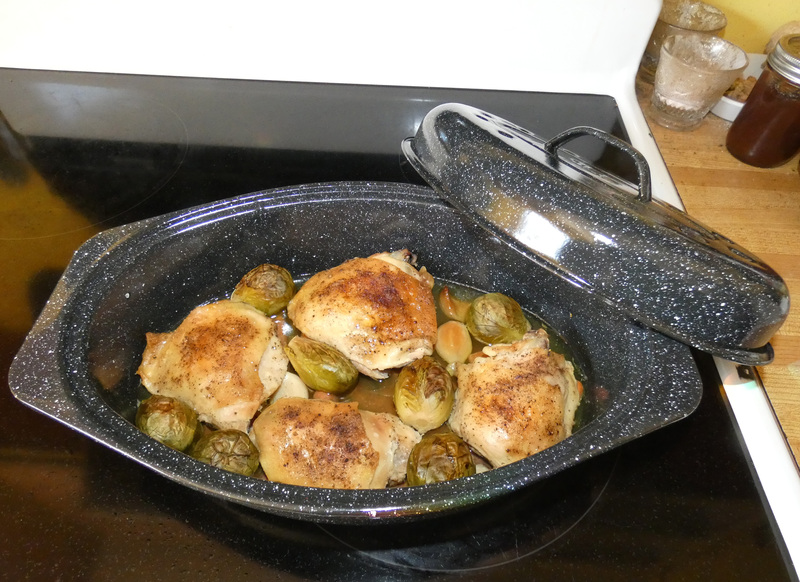 The roasting pans (x3) with lids are Enamel Ware brand and quality items. That's bloody nuts! Here is the Amazon search results link. The $276 one is a discontinued model, and looks different from the one pictured. Buyer beware. A vendor's site with very good prices. Also, photos of other features I didn't show. Second run today with the oven. 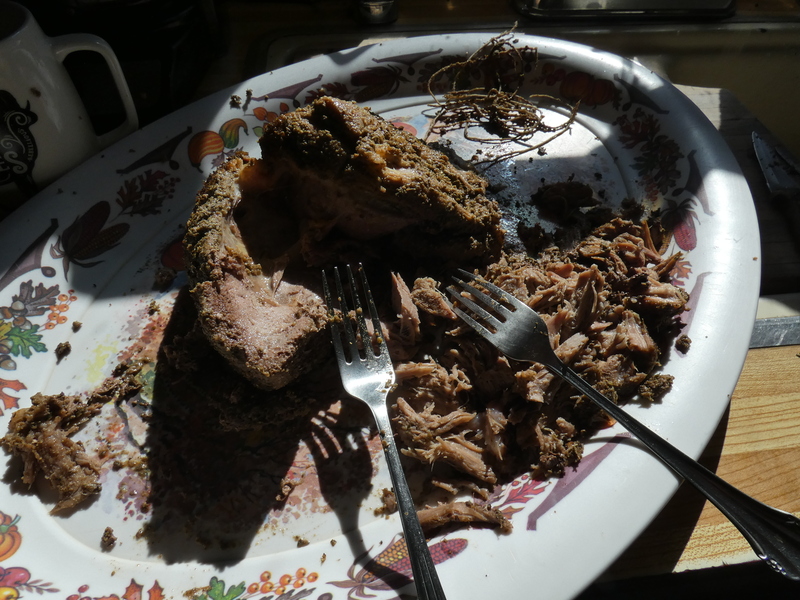 This time the victim, er, main course was a 3#10oz rolled pork shoulder roast. According to the mfg's recipe book, it should have taken 3-4 hrs. 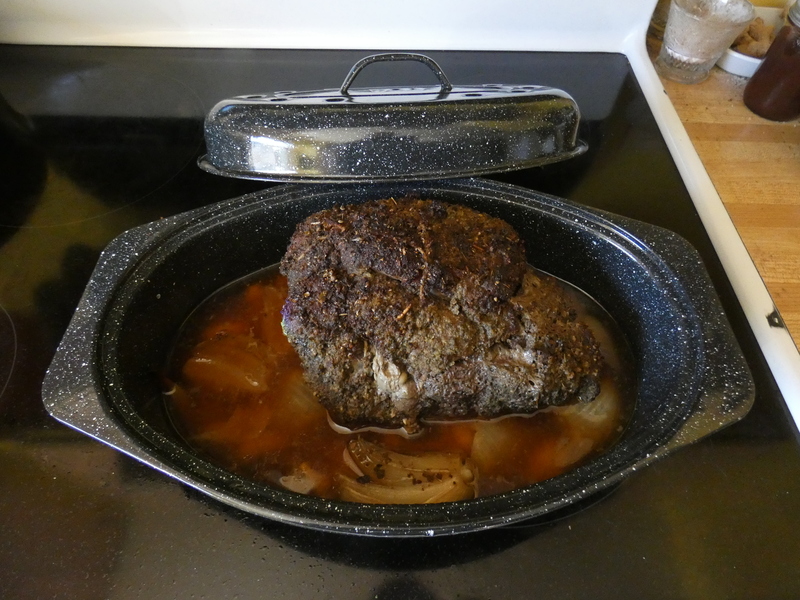 It had an internal temp of 175 at just over 2 hrs, so we pulled it. It probably could have gone 3 hrs (350F) and been a bit more tender. Emptied the spice rack to make a rub for it, cooked with whole garlic cloves and onion quarters. 1. Folks living north of the 49th Parallel might have an issue with this oven in the winter. The tilt adjustment only goes so far (for a good reason I'll mention later), and the sun is so low even at mid-day that it doesn't align perfectly. I'm guessing that if I was another 100 miles north of where I am, I'd be lucky to get 225F deg out of it. Of course this problem goes away when the days get longer and the sun is higher in the sky. 2. If you have the tilt adjustment set at MAX height, make sure it's weighted or staked down (unit comes with ground stakes, mainly for wind stability, but also prevents tipping when opening the glass lid. The weight of the glass being open pushes it beyond the tipping point, and the oven can pitch forward. Not good when it's full of food! 3. WEAR SUNGLASSES WHEN WORKING WITH THE OVEN. Those reflectors do what they are designed to do, and do it very well! 4. If you get condensation in the oven, you don't need to mop it out like I did the first use. Just vent the glass door, and leave it in the sun for awhile longer and it will evaporate quickly. I've done the cardboard and al. foil thing before. Your review had me for prepping until I saw the price. FYI, it would be a great tool in FL most of the time. In western NC we spent one summer when it rained every day for 3 months except 2 days. I do love the solar energy thing though. Pretty much the case with all solar energy thingies. I thought it was appropriate the we celebrate the Spring Equinox by cooking with solar energy. LOL. Anyway, I have read some review and testimonials that indicate this particular oven is efficient enough that even on an overcast (not socked in>raining obviously) day it can muster up 200F temps suitable for low-n-slow roasting... Don't know for sure until I try it.